As we are quickly approaching June, Europe (and most of the global dance community) eagerly countdown to celebrate summer’s unofficial kick-off in Barcelona. As they have for the past few years, the FACT Music Pool Series returns to OFF Week, continuing its commitment to bringing multiple electronic shades in a unique open air location, designed for the first rays of sun to be enjoyed. 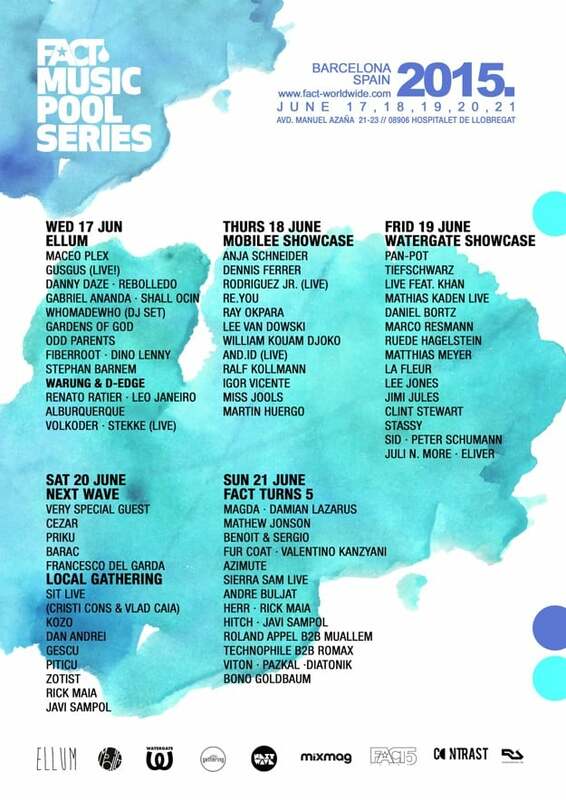 The FACT Music Pool Series is a carefully orchestrated event series in which five brands have taken part in every production detail, aimed at improving the overall poolside experience, from rare Off-Week acts to line ups compounded entirely of heavy hitters. Expect prominent label showcases from Ellum and Mobilee, along with prominent Berlin nightspot Watergate, and Romania’s Next Wave crew. To name just a few, the series will feature DJ sets from the likes of Maceo Plex, Danny Daze, Anja Schneider, Dennis Ferrer, Tiefschwarz, Daniel Bortz, Cezar, and a whole lot more. Additionally, to mark FACT’s fifth anniversary, a fifth date has been added to the musical marathon, in which over 70 acclaimed DJs, artists and creators will perform on an incredible sound system over two stages with Magda, Damian Lazarus, Mathew Jonson, Benoit & Sergio, Fur Coat and more. For the fourth consecutive year, FACT will be a host to a major union of labels and initiatives from various European locations, joining forces in order to promote a top notch line-up at a daydreaming venue.